United States, India, Canada & United Kingdom are where most visitors come from. Topics: Dosomethingdifferent, Cheap Ski Holidays, Family Adventure Holidays, and Adventure Holidays In Africa. adventuretravelshop.co.. Family Adventure Holidays - Adventure Holidays for Singles .. The site has about 959 users daily, viewing on average 10.80 pages each. Assignment For Bright Light Media (England, London) is the location of the nginx server. ns9.blmserver.com, and ns8.blmserver.com are its DNS Nameservers. 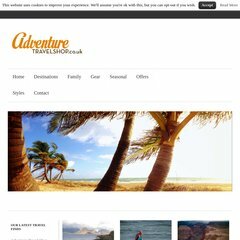 Adventuretravelshop.co.uk's server IP number is 82.113.148.36. PING (82.113.148.36) 56(84) bytes of data.